Massaponax High School recently held a Driver’s Safety event to help new drivers learn safe driving skills. 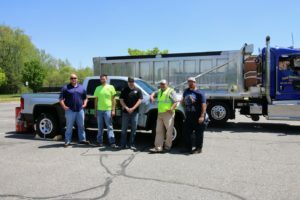 Local representatives from Luck Stone, Tracs Trucking and Superior Paving brought their trucks to the school and talked about safe driving practices when sharing the road with commercial vehicles. “We discussed a number of safety measures such as maintaining a safe driving distance behind and around commercial hauling vehicles, which often need more room to maneuver and stop than the average passenger vehicle,” said Joel Van Campenhout, Manager of Luck Stone’s Spotsylvania Plant. “The students were very attentive and we appreciated the opportunity to meet with them as they begin a lifetime of safe driving.” The event was attended by about 300 sophomores and juniors, many of whom are preparing to get their learner’s permit or who have just started to drive by themselves.